I was standing in line at the grocery store when I read the cover of the Parents magazine. 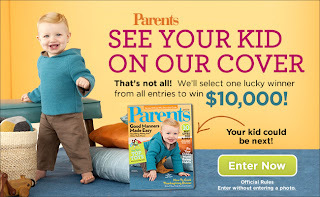 They are having the 2011 Parents Magazine Cover Contest to get your kid on the cover of their magazine. I am soooo entering my little guy in this one. I hope my sister will enter her two boys as well. I know as a mom we all think our kids are the cutest ever and we should! I just want to try to enter this one, because like I say you will not win if you don't enter! How cute would it be to see my little guy or my nephews on the cover of a magazine. I just bought the cutest ocean blue polo onsie from Kohls for my little guy and I will having his mini photo shoot tonight! Upload photos of your child by June 25, 2011. 10 winners will receive an all-expenses-paid trip to New York City to be photographed for an upcoming issue of Parents magazine! One child will appear on the cover. To enter, your child must be between 3 months and 6 years of age. See official rules here. Vote for your favorite entries! Each weekly winner will receive $250.